All of America's electronic warfare aircraft have been developed from extant types. I'm not sure why this is the case and it may be from a perception that the development cost would be less expensive using an extant airframe. in the case of most of these aircraft, they were, indeed, modifications of aircraft that were already in service. However, with the introduction of the EA-6B Prowler, new airframes were built to incorporate the increasingly complex electronics. This has continued with the EA-18G being a development of the F-18F with the first two EA-18Gs being F-18Fs pulled from the production lines for modification. Thanks to the improvements in computer controls, the Growler is able to function with just a single electronic warfare operator in place of the three in the Prowler. As usual, the aircraft was cursed with a relatively long development and the usual cost overruns, mostly due to issues with software. The first 'production' aircraft was delivered in 2007 and by now all USN EA-18Gs have been delivered, fully replacing the EA-6B. The Marines are still flying the EA-6B and with a goodly supply of airframes and avionics available will probably be doing so for some time. The only foreign purchaser of the airplane is Australia which had the last of its 12 EA-18G's delivered to 6 Squadron on 7 July 2017. This is not the first 'Take Off' set Dragon has produced. Their second 1/144 kit was one with an F-18A. 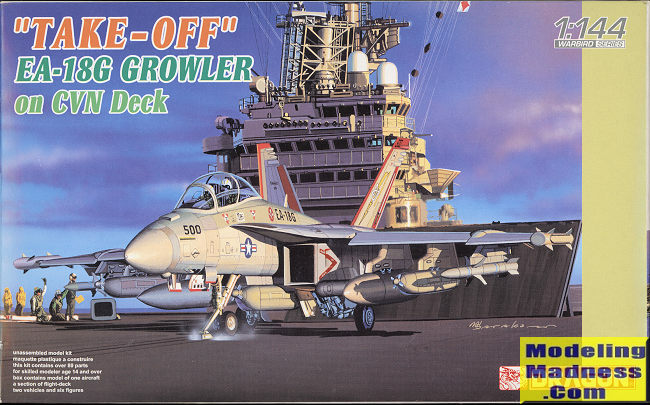 This one combines its F-18E/F kit with the same deck and accessories. Since this is the two seat plane, you don't use the blanking plate for the back seat of the E and instead you are provided with the longer canopy. There are no crew members with this one and the cockpit is simply a tub, two seats and an instrument panel, which is adequate in this scale. Under the wings/fuselage are three jamming pods, two fuel tanks and two HARMs so your model will be pretty heavily laden. Instructions are well drawn as usual with Gunze and Model Master paint references. Since no planes were in fleet use in 2007, the markings are totally spurious, so those wanting a current plane will have to look to aftermarket to provide that. There is also a second sheet for deck support gear. This includes a fire vehicle and a tow vehicle. A pair of figures are also included. The deck section is as large as the bottom of the box and you can pose the JBD up , which most of us will. 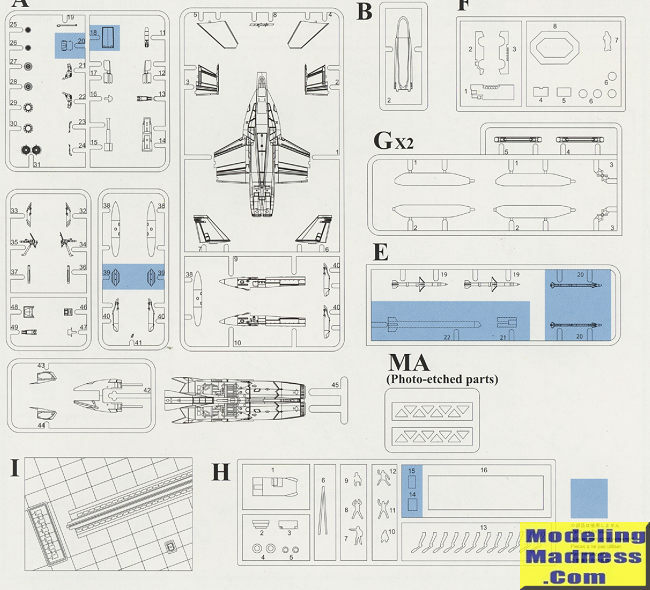 For those who want a nice display area for your 1/144 Navy jets, this is a great way to get one. The spurious markings may be a down side, but then these can be replaced for a few more dollars. This kit is unavailable from all the standard outlets, but can be found on the secondary market.